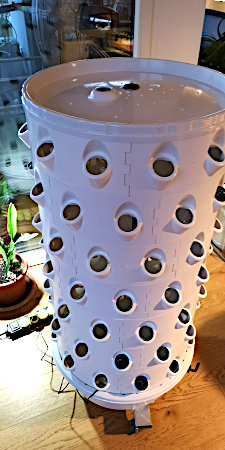 7 plantable ring segments, 82 grow spaces, height 1.3m. Add the top lid and you are ready to run. This is a special page to promote and offer a standalone test setup for end users or testers, who like to test a ‘small’ ready-to-run setup of the aponix vertical barrel. Please note: We assume, we are selling to an end-consumer outside of the EU. If you like to get this package from within the EU, we are required to add the German VAT of 19% on all prices. We are also adding the real freight cost to your address. We are also looking for distribution partners and partners that plan to use our equipment regularly in their urban farming projects. Pricing is different for these target groups. Please contact us in that case. 4 Custom 1/2-inch hose with fittings and valve. * This pump can do a height of 1.3m equivalent of 7 aponix barrel ring segments. It provides a 5/8″ spigot to attach the hose to. This is a German model and it needs 220V and comes with a German electricity plug. It is in the end just a commodity submergible pump that can push liquid to at lease 1.3m high. You can/should use a local equivalent if your local electricity is not 220V! You can increase the height of the barrel any time by adding more pieces / ring segments from our pieces area. If you exceed the max height your pump can push the liquid you will need a stronger pump. Please let us know if you like to go for a higher vertical barrel so we can advise on a larger pump and also provide the required number of pieces. and add the item to your quote list. You can send the request by providing your full shipping address, email and phone a number and the info who referred you to our offer.